Ok, let’s be clear. Having crystals and gemstones around you will not drastically change your life. It will beautify it and may inspire you for sure. And it will facilitate certain changes in and around you. However, it will not do the hard work for you. And by hard work, I mean the inner contemplation (of being) and the outer physical steps (of doing). Crystals, gemstones, and minerals are passive amplifiers of specific frequencies. They help to align our energy resonance with those specific frequencies. In a sense, they act as role models of what is possible and desirable. Gemstones can help you achieve your desires by amplifying certain desirable frequencies. Kind of like how Oprah may inspire you to live a happier and healthier life. Oprah doesn’t make the changes in your life for you to experience happiness and wellbeing, she only provides inspiration and possibilities. When you work with crystals, you must pay attention to the subtle signs and nudges. Those nudges are not always ‘crystal clear’, so developing a relationship with your higher self will help you clarify the messages and act on them. 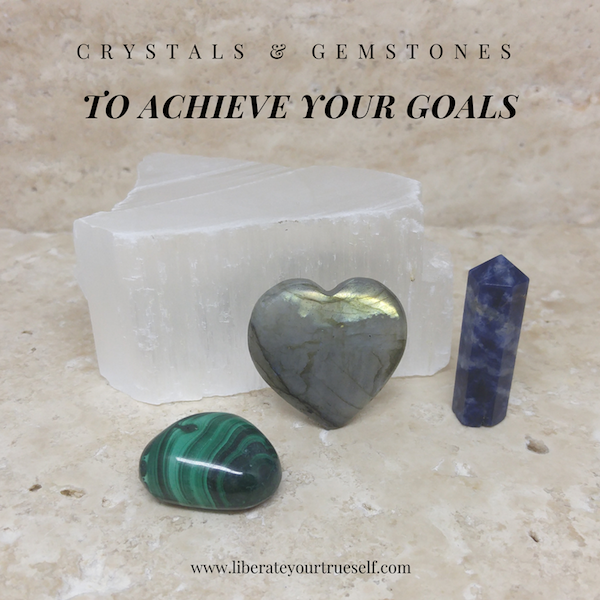 Below is a selection of stones that can help you with the different aspects of working towards a goal. It can be any goal or desire you have. Even the desire for inner peace and fulfillment. Malachite – Helps to transform negative experiences one may not recall and clear the path of obstacles. It also provides understanding and insight before taking action. It is a stone of transformation which assists on the path of spiritual evolution, providing wisdom and strength for the journey. Sodalite – Helps to eliminate confusion caused by unresolved emotions. It may also help you to verbalize your needs and desires, providing the support of others if necessary. Labradorite – Can help you understand the destiny you have chosen and can help you implement that purpose in the world. It provides support in times of transition, strength and perseverance on the path. Provides greater clarity of inner wisdom, faith in oneself and the harmonious workings of the Universe. Selenite – Provides clarity of mind and the ability to recall past-life experiences. It also helps to understand the underlying meaning and workings of any situation. Citrine – It activates and energizes the sacral and solar plexus chakra, enhancing creativity and decisiveness through personal power. It also stimulates focus and endurance and may bring clarity to problems relating to survival issues. It is a gemstone that promotes problem-solving. Tourmaline – Black tourmaline helps to release the belief that we are victims of circumstances. It lifts ones spirit even in times of uncertainty and deflects negative energies. It can increase creativity, physical stamina, and intellectual sharpness. Honey or orange calcite – Calcite activates and amplifies the energy of the Sacral and Solar Plexus Chakra which are the centers of creativity and willpower. Tiger eye – Tiger Eye is helpful in increasing practicality, optimism, and insights in regard to inner conflicts. It can bring a sense of renewed passion for one life and purpose. Fossil – Many fossils have formed over millions to billions of years and can help us tap into that sense of timelessness. Bringing forth patience and supporting ease of transformation. Ruby Fuchsite – Having both the properties of Ruby (instilling a passion for life and giving you the courage to go after your dreams) and Fuchsite (bringing an understanding of the effects of our overall lifestyle on all areas of our life) it can help to bring the necessary balance to keep going. Garnet – Works quickly to broaden awareness and increase the ability to manifest. It charges a person’s energy and helps to bring projects from idea to action plan. At the same time, it supports the acknowledgment of personal responsibility, patience, and value in cooperation. It is said to be a stone of commitment to purpose, self and others. Carnelian – Can increase physical energy, creativity, personal power and compassion as it is connected to with the inherent love in everything and everyone. Carnelian also provides attributes of curiosity and initiative, stimulating analytical capabilities and inspiration. These gemstones will strengthen the connection with your higher self and the ability to receive clearer information. This will help you take certain steps that may feel scary or risky. Kyanite – Aligns quickly and with no effort the Chakras and the energy bodies of the person, facilitating access to the Higher Self. It also brings peace and calm to the whole being which is necessary to experience a heightened state of awareness. It facilitates clarity, decision-making, and intuition. And can also assist in producing the energy required to finish a project. Chrysocolla – provide great inner strength and harmony by releasing difficult emotions. Apatite – helps you understand that strength comes from higher core values and via loving thoughts and actions. It is helpful in the application of insights in practicals ways and can stimulate the development of psychic abilities. It promotes deeper states of contemplation, inner clarity, and self-actualization.